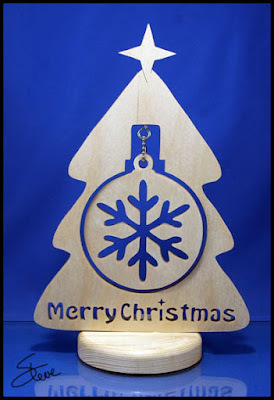 One Ornament Christmas Tree Scroll Saw Pattern. I like simple designs that are still able to show creativity. It's what I shoot for and rarely achieve. It's actually a pretty difficult task. 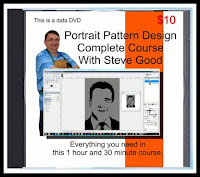 It's very easy to over design a pattern. I like this pattern a lot. It celebrates Christmas in a simple way. I cut it from Baltic birch plywood. I used pine for the base. It could be cut from more exotic woods but it does not need that to look nice. It's just simple. There is one basic technique in scrolling that is difficult to teach. It's difficult because you have to feel it for yourself. It's hard to show because it's such a subtle thing. That technique involves using the side and back of the blade as a pivot when making sharp turns. When you come to a turn you need to stop the blade from cutting as you turn or you will get a rounded off point. The cut will wander away from the pattern line. The obvious assumption is that you would just quit pushing forward on the wood and make the turn. That is actually very difficult to do. The easy way to make a sharp turn is to shift the pressure from the teeth of the blade to the side and back of the blade. As you make the turn you will gently push the wood into the side of the blade, as you continue the cut the pressure will shift to the back of the blade. As soon as the blade is pointed in the direction of the cut again you can move the pressure back to the teeth and continue cutting. The technique needs to be simultaneous. You need to rotate the pressure as you make the turn. Easier done than said. I see many scrollers do this without even recognizing that they are doing it. There is no thought process that says, I'm ready to turn push the board sideways. It generally just happens even if you don't know you are doing it. You will just notice that your turns are sharper and the blade is not cutting away from the pattern line when you make turns. Even if you are doing the technique without recognition, it's good to understand what is happening. As you grasp the subtle feel to will be able to use it to better advantage. The next time you sit at your saw try to analyze your turns. See if you can feel this technique. It will improve you cutting a lot once you have this technique under control. I recently purchased two packs of this BB ply from Woodpeckers on Amazon. It's nice plywood. 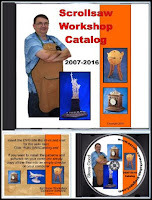 Perfect for ornaments and many other scroll saw projects. 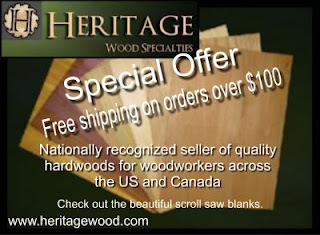 GRADE B/BB – This hardwood has a single piece face and a back veneer. The face veneer has a smooth surface with a light uniform color, while the back surface typically has 1-2 small color-matched patches. The thick face veneer also provides a smoother surface for CNC routers or engraving machines to glide on the wood. HEAVY-DUTY – This multi-coated plywood made from Baltic Birch offers exceptional durability, rigidity, and stability. Its surfaces also provide excellent holding power for glue and screws. 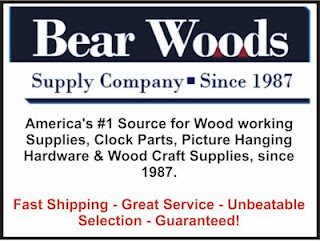 MADE IN Russia – Known as one of the top producers of lumber in the world, this Russia-made plywood was manufactured using the latest methods in wood production to build construction hardwood that’s extremely durable and creep-resistant. 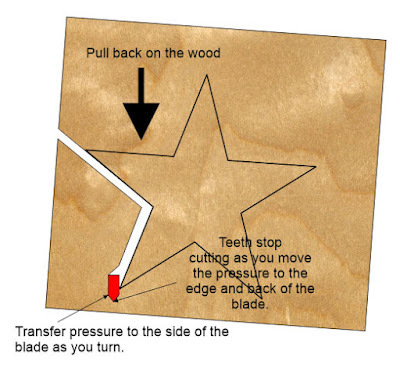 SCROLL SAW AND LASER CUTTER COMPATIBLE – The thick layers of this Baltic Birch Plywood are designed to smoothly glide through scroll saws and laser cutters, making it the perfect plywood for both low- and high-production woodworks that require efficient woodcutting. 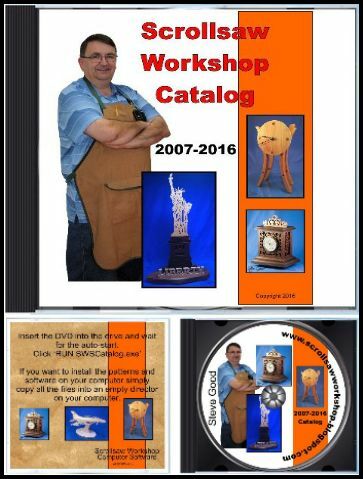 EXCELLENT AFTER-SALES SERVICE – We are dedicated to partnering with business owners, home crafters, and woodwork artisans who strive to perfect their crafts. Our highly trained customer care agents are equipped with expertise regarding our products, and we will be happy to assist you with your concerns and inquiries.